As the title says, this is my last postaday2011 post. I have decided to stop the postaday2011 challenge for a number of reasons. I am currently writing up my PhD thesis, with all the work I have to do for my thesis, writing a new post every day is becoming a bit too much. Also, I want this blog to focus a bit more on quality and less on quantity. Finally, the time it takes to write a post every day means that I have recently not been able to visit and comment on other people’s blogs. There are many great blogs out there and I think it only fair to give them the time other people give mine. Since starting the postaday2011 challenge on the 1st January, I have managed a total of 68 posts. Thanks to everyone that has visited my blog during this time and left comments. From now on, I aim to post on this blog around four times a week (perhaps Monday, Wednesday, Friday and Sunday). I hope that you continue to visit. On Sunday, I watched the first part of a new series on the BBC called Wonders of the Universe. It is presented by physicist Brian Cox and features such though provoking concepts as the nature of time (which was the focus of the first episode) and where we come from. If you live in the UK, you can catch Wonders of the Universe on iPlayer here; I really suggest you do so. At number three is a cult comedy that I have loved since I was about twelve years old. Red Dwarf is set on a mining spaceship in deep space 3,000,000 years in the future. The main character is Dave Lister who, due to a radiation accident on board the spaceship (from which he was protected), is the last remaining human in the universe. Accompanying Lister is a bunch of eccentric misfits. Arnold Rimmer was responsible for the radiation accident that killed the rest of the crew; including himself. Rimmer was resurrected as a hologram by the ship’s onboard computer (Holly) to keep Lister sane. This is despite the fact both men despise each other. Cat is a humanoid that, over 3,ooo,ooo years, has evolved from the cat that Listed illegally stowed onto the spaceship. Kryten is a mechanoid who is rescued by the crew in Series Two from a crashed spaceship upon which he served. Finally is Kristine Kochanski, a navigation officer originally killed in the radiation accident who was found in an alternative dimension in Series Seven. 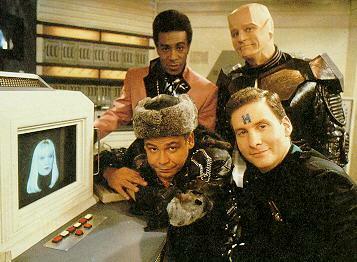 Like all good comedies, Red Dwarf is all about the main characters and the relationships between them. What really makes Red Dwarf stand out from other British comedies however, are the unique situations in which the crew often find themselves. The science fiction setting (which is taken very seriously by the show) allows Red Dwarf to explore such themes as time travel, artificial realities and parallel universes. Perhaps the only real criticism that I can level at Red Dwarf are the inconsistencies between series, with the Eighth Series perhaps not as funny as the rest. I am pleased to hear that recently, another series (the first full series since the Eighth Series in 1999) has recently been announced for 2012. You can buy all eight series of Red Dwarf here. I had a nice lie-in this morning following a not so peaceful Friday night. 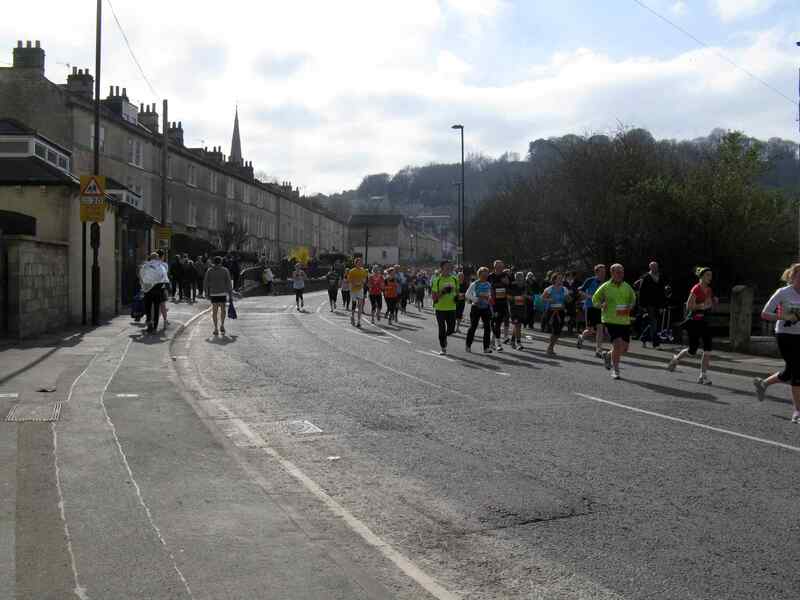 So nice in fact that I forgot that today was the day that the Bath half marathon took place. I emerged from my building around 1pm to find hundreds of people running down the road. Stopping to watch for a while before I had to conduct the daily drop-in session, it struck me how expressional each face that ran past was. It was like each face had its own story to tell as to why that person was running the half marathon. On Wednesday, I posted about what keeps me up at night. Last night, the fire alarm certainly kept me awake. At around 3am, the alarm sounded. Since the fire alarm panel told me that the source of the alarm was the roof of one of the blocks in my halls (which I did not have access to), I had to wait for university security and the fire brigade to attend. It took about 50 minutes to get the all clear to silence the alarm. During this time, all the students (including me) were standing around outside. I went back to bed at around 4.30am and just as I was drifting off to sleep, the alarm sounded again. It was the same problem. The alarm was silenced and reset once more. At around 6.30am, just after going to bed again, guess what happened… Another alarm! Following this one, I gave up going back to bed and just waited for an electrician to arrive to fix the problem. The electrician arrived at around 8.30am. After that, I finally got a bit of sleep (until having to get up at 12pm for my daily drop-in session). Hopefully, tonight will be more peaceful.